How many of you reading this review have actually seen the Swedish film released in Australialast year? The Swedish film in question is based on the novel of the same name and it was met with much critical success. In this reviewer’s opinion, it was a very entertaining and solid film and at almost two and a half hours, it really knew how to utilize time. The fact that quite a few audiences didn’t know about was the fact that it was originally made as a TV movie, despite it looking very much like a film. NOW, as for the American remake, it’s getting anticipation and praise up the wazoo because it’s directed by one of the best in the business, David Fincher (Fight Club, Se7en). So is it awesome and brutal and most importantly any better than the original? This reviewer is sorry to say, but no. However, it’s still an entertaining and well made film. Daniel Craig plays Mikael Blomkvist, a journalist who has essentially lost his reputation and credibility for a piece that was set to uncover a rich businessman for the crook he is, however it all fails miserably. Even with a disgraced name, he’s called upon by an old, rich man (Christopher Plummer) to solve a mystery that’s plagued their family for over 40 years. With almost nothing left to his name, Blomkvist accepts. Things get real interesting when Blomkvist needs an assistant, and who better than to hire the woman that hacked into his computer and life all in the name of a background check. She wears a nice array of piercing and black, leather clothing items, her name is Lisbeth Salander (Rooney Mara). The two, using their greatest detective skills attempt to solve a murder case that dates back to the mid 60′s. If we hadn’t been treated to the Swedish film just one year ago (two for some parts of Europe, but even then) then this would’ve been a revelation, Fincher’s one of the best in the business but even he doesn’t add anything greatly original or new to the story. There are many scenes that are shot for shot and when they’re not remotely identical in nature to the Swedish film, it still doesn’t resonate. In saying all of this, there is a lot to be admired and it’s these reasons why it gets a recommendation. The performances here are quite solid, Craig being an improvement on the original Blomkvist and Rooney Mara as Salander, being given one of the biggest shoes to fill as an actor, (the original actress who played Salander (Noomi Rapace) gave a phenomenal performance, even to the point where some will only recognise her as Salander). Mara’s performance is almost on par, it really is something and kudos to Fincher for picking an actress who is dedicated and relatively unknown. American remakes or in fairness, a large amount of remakes are mostly redundant and superfluous. 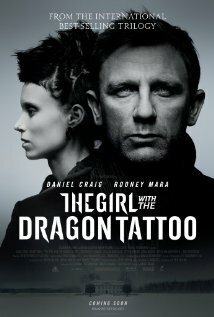 The Girl with the Dragon Tattoo, even with the talent behind it, really did not HAVE to be made. But since it’s been made, it is worth seeing in how well at times its directed and the performances, and the notable differences (some work well). Oh and if you haven’t seen the Swedish film and intend to see this for the director’s name and stars involved… you’ll have a mighty fine time. Note: Dragon Tattoo has one of the best opening credits sequences this year and in a particular scene towards the end, one of the oddest music choices in the history of film.